Note to aspiring makers of B movies — if you’re going to blatantly rip off Casablanca (1942), take a page from director John Brahm’s book. Don’t just change the characters’ names and tack on a happy ending. Do it with real panache and also change the hero’s occupation to “pearl smuggler” and spice up the love triangle by giving the heroine a case of amnesia. True to its title, Singapore is steeped in the exoticism and heat of the Pacific Rim, but like the film noir techniques Brahm uses to tell his story, it’s mostly just window dressing for a run-of-the-mill potboiler. But that’s not entirely a bad thing. Brahm keeps things moving along nicely, and Singapore is a lot of fun if you’re in the mood for a melodrama and you can overlook some contrivances. When Matt Gordon (MacMurray) returns to Singapore after World War II, it’s clear as soon as he steps off the plane that he has a history there. Deputy Commissioner Hewitt (Richard Haydn) has Gordon brought to his office, and he reminds him that the penalty for removing illegally obtained pearls from a British colony is a minimum of 10 years in prison. Gordon sits down in the hotel bar, orders two gin slings, and sits alone, reminiscing about life in Singapore before the war. He fell in love with a beautiful young woman named Linda Grahame (Ava Gardner), but their whirlwind romance was cut short by the beginning of hostilities with the Japanese. They were engaged to be married, but before they could tie the knot she was killed in a bombing raid, and Allied forces had occupied his hotel room, where his $250,000 worth of pearls were secreted in the motor of the ceiling fan in his room. Of course, Linda didn’t really die in a bombing raid. She was injured and stricken with total amnesia. Unable to remember any details of her former life, she was interned in a Japanese concentration camp, where she met Michael Van Leyden (Roland Culver), a British plantation owner who saved her life many times during the war. Now they are married, and her name is Ann Van Leyden. No matter how many times Gordon calls her “Linda,” she just can’t remember their time together, or the love they shared. So Gordon has two problems — winning back Linda/Ann, and somehow getting his pearls out of the ceiling fan of a hotel room that is now occupied by an obnoxious married couple. The problem of the pearls is compounded not only by the watchful eye of Deputy Commissioner Hewitt, but also by the corpulent gangster Mr. Mauribus (Thomas Gomez), who wants the pearls for himself. 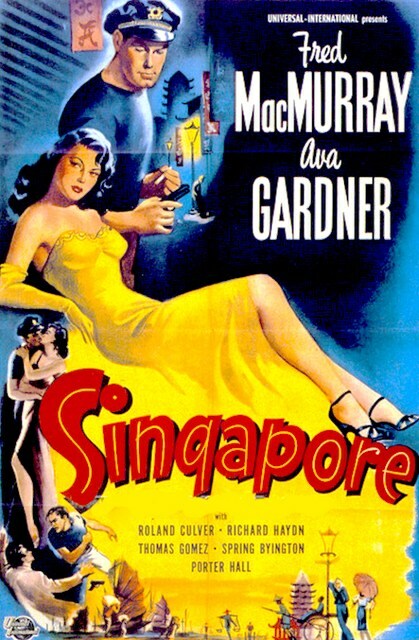 I liked Singapore despite its flaws, and it’s always enjoyable to watch the beautiful Ava Gardner do anything. 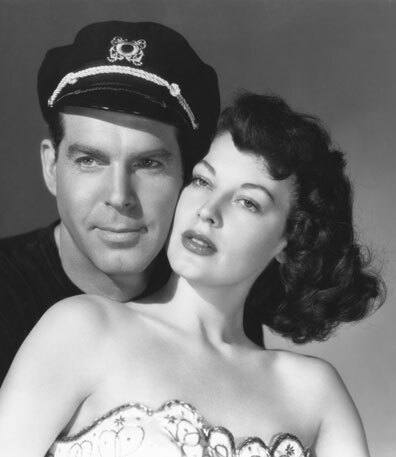 I didn’t completely buy her relationship with the hulking, thuggish Fred MacMurray — I’ve always thought MacMurray was better in comedic roles than dramatic ones — but it works well enough to keep the film moving. 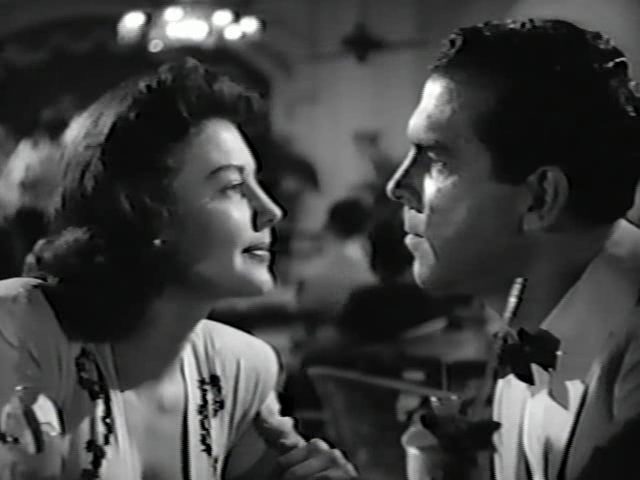 Posted in 1947, August 1947 and tagged Ava Gardner, Film Noir, Fred MacMurray, Jerry Bresler, John Brahm, Richard Haydn, Roland Culver, Seton I. Miller, Thomas Gomez, Universal Pictures. Bookmark the permalink. They even threw in a corpulent gangster to take the place of Sidney Greenstreet. I’m impressed. Nice review! Thomas Gomez is great. He mostly played forgettable roles as “heavies” in movies like this and Johnny O’Clock. But his one great sympathetic role is as John Garfield’s brother in Force of Evil, which is one of the great Lefty noirs of the ’40s.